WOMEN MINISTRY : JEWELS OF CHRIST. The Covenant Feminine Fellowship International is a ministry dedicated to developing our women into becoming that woman of virtue. This is done through encouragement, Every woman is encouraged to put God first by empasizing her personal relationship with God. This relationship is the key to her success. THE COVENANT FEMININE FELLOWSHIP I NTERNATIONAL meets two times every month, Second and Last Thursday of the month to study the word of God and recieve practical life lessions through Seminars : Health. Financce, Family, and Relationships. Intercessory Prayers for Single Ladies who are looking for their own rightful Husband and Special prayers to Women who are looking for the fruit of the womb, Praying for Pregnant women for safe delivery. Every month an inspiring testimony from one of the sisters in the ministry is given, as well as an exhortation in the word by our very own Rev. Deborah U. Nnams. COVENANT FEMININE FELLOWSHIP INTERNATIONAL( C:F:F.I.) is an Inter-Denominational Outfit. Rev. Deborah U. Nnams is a co-founder of The Great Achievers Inernational Chuches world-wide and was consecreted as Co-Pastor by Bishop Simon Iheanacho, The President UK WORLD EVANGELISM TRUST ( International) London. Rev. Deborah is a woman of great faith and patience. As a female, wife, mother and minister she is part of the virile, vibrant and dynamic pentecostalism sweeping through the world. Rev. Deborah is the president and founder of COVENANT FEMININE FELLOWSHIP INTERNATIONAL ( CFFI) one of the largest attended women's conference in Nigeria and Europe. The conference was successful in teaching women how to please their husbands, care for their children, basic home management,the woman's importance in the body of Christ and how to present the Christian virtous women to their communities. Most important of all, many women recieved Jesus Christ as their LORD and SAVIOR. Rev. Deborah frequently ministers on the importance of the home and family. She also has special anointing to minister to women who are believing God for Children. As Rev. Deborah Nnams ministers, she shares her own personal testimony and teaches women how to believe God and stand on His Word. Rev. 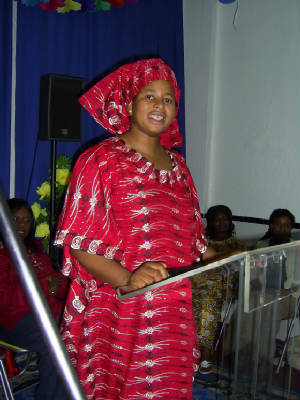 Deborah Nnams is the wife of Apostle Dr. Prince Nnams Nmecha Kalu,The General Overseer/ Founder : The Great Achievers International Churches - World-wide. The Nnams have four children:Princess,Sharon,Success and Jennifer. The Covenant Femenine Fellowship International shall be in operation at all GAIC branches worldwide. The General Overseer’s wife shall be the international co-ordinator. The General Overseer shall hold the position of international president. To create an avenue whereby younger sisters can learn from older ones - having older women mentoring younger ones. To introduce Winnas Women College. This college will teach only courses related to women affairs such as: marriage, good family, women and children, evangelism ministry. Vocational training - soap and candle making, tye-dye, etc. On this web site I'll offer a personal account of my own beliefs. I'll describe how my beliefs have changed my life in profound and exciting ways, and how I think they might change the lives of others. I'll also be sure to provide links to my favorite sites as well as information about organizations that help strengthen or support my beliefs.